Join OMG Media Solutions in celebrating the “Greats Gone 2 Soon” . . .
“Greats Gone 2 Soon” is a music series honoring the greatest entertainers of all times who left us with their gift of unforgettable memories through their music. These artists presented are the legendary Etta James, Teddy Pendergrass, Isaac Hayes, Barry White, Luther Vandross, Teena Marie and Rick James. Musicians4Musicians, founded by Kathleen Johnson in 2009, was established to support musicians through rough times with gigs, health/wellness, and even housing. “While the Twin Cities music scene is strong, extraordinarily talented musicians have faced years of hardship economically. In my opinion, extraordinary talent and experience does not equate to a good living in the Twin Cities,” explained Kathleen Johnson. Ms. Johnson went on to say, “The Johnson Music Family” has been a major player in the Minneapolis music scene for decades with deep strong roots that are planted in the vaults of Paisley Park Studios. Ms. Johnson and her brother, Kirk Johnson collaborate often on music projects. Mr. Johnson is the producer of this upcoming music concert series, “Greats Gone 2 Soon,” which launched at the Dakota last November. 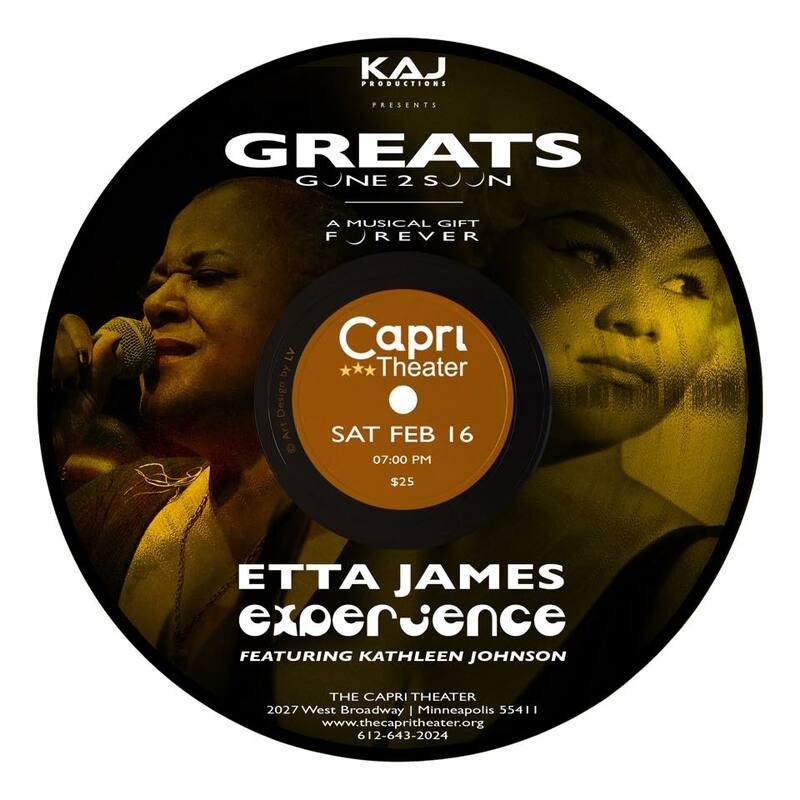 His newest performance project, “Greats Gone 2 Soon – The Etta James Experience” is a musical production showcasing Etta James’ songs and some of the artists she influenced, as well as, those who influenced her. Kicking off the Valentine’s weekend of love music series on Friday February 15th, KAJ Productions presents The Etta James Experience, featuring Kathleen Johnson at the Dakota, on February 16th, a 40-year celebration of “The Survival Skills Institute in North Minneapolis at The Capri Theatre, followed by Sunday, February 17th, a show honoring George “Smoove G” Scott at Famous Dave’s in Uptown. “Bring the entire Family as we believe great music must be passed on to our youth”, explained KAJ Productions CEO Kirk Johnson. Connect to “Greats Gone 2 Soon” on Facebook for more information or call (952)220-4491.